SEATTLE — Legal challenges against President Donald Trump’s revised travel ban mounted Thursday as Washington state said it would renew its request to block the executive order and a judge granted Oregon’s request to join the case. The events happened a day after Hawaii launched its own lawsuit, and Washington state Attorney General Bob Ferguson said New York state also asked to join his state’s legal effort. Massachusetts Attorney General Maura Healey said the state is joining fellow states in challenging the revised travel ban. Washington was the first state to sue over the original ban, which resulted in Judge James Robart in Seattle halting its implementation around the country. Ferguson said the state would ask Robart to rule that his temporary restraining order against the first ban applies to Trump’s revised action. Robart on Thursday granted Oregon’s request to join Washington and Minnesota in the case opposing the travel ban. Oregon Attorney General Ellen Rosenblum said the executive order has hurt Oregon, its residents, employers, agencies, educational institutions, health care system and economy. Trump’s revised ban bars new visas for people from six predominantly Muslim countries: Somalia, Iran, Syria, Sudan, Libya and Yemen. It also temporarily shuts down the U.S. refugee program. Unlike the initial order, the new one says current visa holders won’t be affected, and removes language that would give priority to religious minorities. Hawaii Attorney General Douglas Chin said that the state could not stay silent on Trump’s travel ban because of Hawaii’s unique culture and history. Hawaii depends heavily on tourism, and the revised ban would hurt the state’s economy, he said. The courts need to hear “that there’s a state where ethnic diversity is the norm, where people are welcomed with aloha and respect,” Chin said. He noted that the new travel ban order comes just after the 75th anniversary of the Feb. 19, 1942, executive order by President Franklin Roosevelt that sent Japanese Americans to internment camps during World War II. That order was put in place after the Japanese attack on Pearl Harbor. Hawaii had an internment camp. Ferguson said it’s not the government, but the court, that gets to decide whether the revised order is different enough that it would not be covered by previous temporary restraining order. “It cannot be a game of whack-a-mole for the court,” he said. “We feel very confident with how that was crafted and the input that was given,” Spicer said. Other states that have filed briefs supporting Washington’s initial lawsuit include California, Connecticut, Delaware, Illinois, Iowa, Maine, Maryland, New Mexico, Pennsylvania, Rhode Island, Vermont and Virginia. In his initial lawsuit Ferguson said the original ban was unconstitutional and hurt the state’s businesses and universities. In filing a lawsuit Wednesday night, Hawaii said the revised order would harm its Muslim population, tourism and foreign students. Attorneys for Hawaii filed the lawsuit against the U.S. government in federal court in Honolulu. The state had previously sued over Trump’s initial travel ban, but that lawsuit was put on hold while other cases played out across the country. Imam Ismail Elshikh of the Muslim Association of Hawaii is a plaintiff in the state’s challenge. The ban will prevent his Syrian mother-in-law from visiting him, he said. The mam is a U.S. citizen, has rights and would be prevented from seeing his mother-in-law, Chin said. The mother-in-law is awaiting approval of a visa to see her relatives in Hawaii. The woman and others have become victims because of the ban’s “standardless set of waivers and exceptions that weren’t set by Congress,” Chin said. Hawaii’s lawsuit challenging the travel ban focuses on damage to the state’s economy and mainly tourism. Chin says the tourism angle is unique because the state relies heavily on visitors and Hawaii officials have a right to defend the economy. He said people may fear traveling even within Hawaii because they would be forced to encounter a federal agent every time they get on a plane to visit a neighboring island. Sinco Kelleher reported from Honolulu. Associated Press writers Tarek Hamada in Phoenix and Gene Johnson in Seattle contributed to this report. 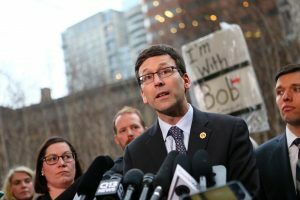 Left: Washington state Attorney General Bob Ferguson speaks at a press conference in February outside U.S. District Court in Seattle, Washington. Photo by Karen Ducey/Getty Images.